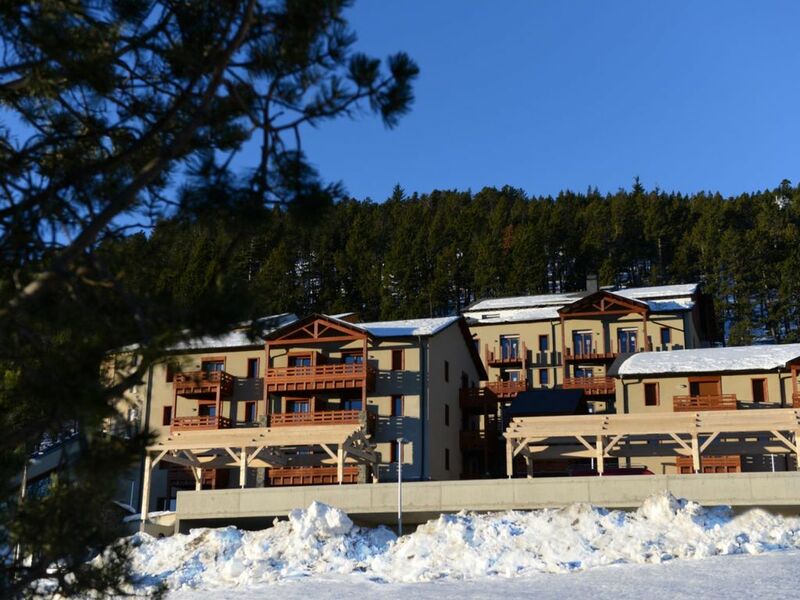 Located in the Eastern Pyrenees’ Capcir Valley, Les Angles resort has successfully modernized its amenities while retaining the charm of an authentic village.The tourists can enjoy winter sports and Catalan entertainment at the same time. The residence Les Chalets de l'Isard - “Famille Plus” certified will attract you by its wood and stone architecture, which fits perfectly into the surrounding pine forest. Residence with 5 buildings, 3 floors. 1 reception in building E. Elevators in 3 buildings. During your stay, you can recharge your batteries in the Relaxation Centre with its heated indoor pool - from 10am to 7pm, closed on Wednesday afternoon except during French school holidays- ; Wellness centre with Jacuzzi and hammam : adults over 18 years old only. Closed on Wednesday afternoon except during French school holidays. Kids club (from 4 to 12 years) during school holidays. Luggage room, raclette services, sledges, board games, hairdryer on loan (subject to availability). Outdoor car park (subject to availability) - Public and free. Living area with flat-screen TV, convertible sofa bed. WIFI - free at the reception. Kitchen corner with fridge, micro-wave, cooker hood, glass-ceramic cooking hobs, coffee machine and kettle. Bathroom with a bath. Separated toilets. 2 rooms 4 people (2P4) - 27m²: 1 bedroom with a double bed (160 x 200). Some apartments are adapted for people with reduced mobility. 2 rooms cabin 6 people (2PC6) - 38 m²: 1 bedroom with a double bed (160 x 200), 1 cabin with bunk beds (80 x 190). 3 rooms cabin 8 people (3PC8) - 50 m²: 2 bedrooms with a double bed (160 x 200), 1 cabin with bunk beds. Reception opening hours (subject to modification): Every day from 8.30am to 12.30am and from 4.00pm to 7.00pm. Closed on Wednesday afternoon. During school holidays: from Sunday to Friday, from 8.30am to 12.30am and from 4.00pm to 7.00pm. Saturday: from 8.30am to 12.30am and from 3.00pm to 8.00pm. Please contact the reception for any arrival on those days or late arrival at +33.04.68.30.45.50. Arrival: from 5 pm. Departure: before 10 am. To be noticed: bunk beds do not suit kids under 6 years old. Décret n° 95 949 du 25/08/1995. Indoor heated swimming-pool, from 10am to 7pm, closed on Wednesday afternoon except during French school holidays. Wellness centre with Jacuzzi and hammam : adults over 18 years old only. Pets - 10€ / pet / day - 46€ / week (1 animal per apartment - 1st and 2nd categories forbidden). Early check-in: arrival from 11 am (subject to availability) - 75€/accommodation. Indoor car park (on reservation, subject to availability) - 8€/day – 35€/week. Laundry - Washing : 5€ - Drying : 3€. Deposit - 300€ per apartment. Tourist tax - 0,80€ per night and per person, from 18 years old. 2 km from shops (free shuttles every half hours during school holidays). At the foot of the slopes. 55 km of ski slopes - 45 ski slopes (14 green, 9 blue, 14 red, 8 black) - 19 ski lifts (1 cable car, 4 chair lifts and 14 button lifts) - 363 snow canons - 36 km of cross-country skiing. Snowshoeing, snake sledging, dog sledging, under-ice diving, laser biathlon. Entertainment: cinema, restaurants, bowling, bars discothèque, zoo.